An anthology of stories, “posthumous collaborations” between Lovecraft & Derleth, originally published as a collection in 1974. 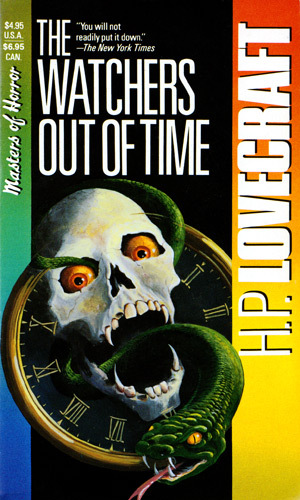 The Lurker At The Threshold, although included with the original 1974 Arkham House edition, was omitted from this edition and was published by separately. Whether you believe, as some Lovecraft scholars do, that Derleth “warped” Lovecraft’s bits & pieces to suit himself rather than stay true to the style and form for which Lovecraft is loved, you can’t deny that he was able to weave an entertaining tale. Derleth may or may not have abused his access to the remaining writings by attaching Lovecraft’s name to stories he had little or nothing to do with but it’s also undeniable that Derleth approached Lovecraft’s creations & ideas from a Christian point of view while Lovecraft subscribed to no religion whatsoever and injected much of his own beliefs (or lack thereof) into his stories. In time, Lovecraft could very well have gone in the same direction as Derleth had he lived longer and developed a belief system other than his well-known atheistic, purely scientific point of view. He required proof of the existence of the soul, afterlife, God, etc. From what I’m told, as you age, that proof can come at any time and in many forms, so who knows? If HP had lived to a ripe old age, he could’ve eventually done a “one-eighty” and reinterpreted his own creations in future tales, giving a “good versus evil” bent to what were originally just mysterious beings above good & evil and everything else.